This page contains articles written by the local freemasons in Protugal, and some written by the United Grand Lodge of England. 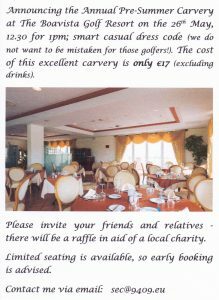 Lancaster Lodge Ladies Night: WBro Maurice Jean-Jacques Maurice, invites you to his Ladies Evening which will be held at the Vila Gale Cascais, Rua Frei Nicolau de Oliveira, 80, Cascais, 2750-641, – on May 19th at 19:00. Discoveries Lodge Pre Summer Carvery (click on image).